You must make reservations at least 5 minutes in advance of the time at Via Verdi Cucina Italiana. Parking is available for free in the lot directly behind the restaurant just off of 69th street; both entrances are ours to use. In-addition, AFTER 5PM: Guests of Via Verdi are welcome to park in the well-lit Chase Bank parking lot. Metered parking on the street is also available. Take Biscayne Blvd from Downtown north and then when you get to 69th Street the restaurant is on the left side of Biscayne (north / west side). Via Verdi Cucina Italiana is headed by Fabrizio and Nicola Carro, who grew up in Northern Italy. They have used their cooking talent at the Trump SoHo hotel, the Martha Stewart show, the Today show and Rocco’s Dinner Party. Stop by the Social Bar for a drink after work or meet a group of friends and sit at a private table or at the bar while enjoying signature cocktails and some bar bites. Via Verdi also offers an outdoor patio that is open year round. The green garden space is set up for a lovely weekend brunch or to accommodate a large group for dinner. It is the perfect place to eat al fresco. Enjoy authentic Italian food with a partner seated in the Indoor Boutique. Along with homemade pasta, perfectly paired wine and lowered lighting, the secluded wine cave creates the perfect romantic atmosphere for an unforgettable dinner. The food was amazing, everything we tried was delicious and authentic. The service was great too. I can't wait to go back! Great experience, even though we had our own server all of the staff checked in to make sure we were doing fine. The food was delicious and the ambiance as beautiful!!! Will definitely be coming back. Awesome experience away from the hustle and bustle of Miami. A true must experience. It was happy our Monday so selected drinks and cocktails were 6$ and pasta dishes were half price. However the preparation and delivery of the cocktails was still excellent, as was the food and the rest of service. Warm, friendly, attentive service, great, delicious, food, comfortable well spaced tables, and moderate prices; WHAT COULD BE BETTER. I go often, and I will continue to do so. There is no better dining package on the Upper East Side of Miami. Via Verde hits all the bases - this was home run. But good luck . There is always a way to fix things . Great atmosphere! Love the food. Best italian in town. Lovely place with authentic Italian food, fantastic drink list and personal service. Un vero ristorante italiano a Miami! Piatti ottimi dall’antipasto al dolce coerenti con la vera cucina italiana nel pieno rispetto dei sapori e delle materie prime. Top Top! The place was very quiet during lunch time, convenient for people who dinning alone or with friends. Delicious food and a great ambiance. Recommended by a friend, and we loved it. We were there for the first time this past weekend, and we were very pleasantly surprised. The food was excellent, there were 5 of us and everyone enjoyed their choice. I specially enjoyed the non-Ossobuco and my Fiancee his Lasagna. The drinks were also great, specially the strawberry Mojito. Our waitress was fantastic, too bad I forgot her name. We will definitely come back! Great Italian cuisine with a modern twist and a full bar!!!!! Lack of flavors. Nothing out of the extraordinary. This is still my favorite Italian restaurant in Miami. Consistently excellent entrees, generous portions with a lot of variety. Oh, and they make great cocktails! My husband and I went back for dinner with some friends. I was highly disappointed to see that the Food and the service was below average. The same manager that use to give us great service was overwhelmed which is surprising because the restaurant was not busy at all. Our main entree took a while and the ravioli that I loved before was undercook and the sauce barely had any flavor. I asked for cheese to go on the pasta and he brought it by the time we were almost done with dinner. When we asked for the second round of beers he said he had run out of glasses. (The restaurant was 6% full). Just overall a disappointment specially since I used to love this place. Locals place. Good food. Relaxed atmosphere. I loved it. Slow service , food not very good. Once again a great experience. Always reliable. Pleasant and attentive service. Wonderful attention to food allergies. This place is a real gem. We have been here a few times and its always a great experience. We had a wonderful meal and excellent, friendly service. The only surprise was that they automatically added $20% service on the bill. I understand that it’s usually done for a table larger than 6 but they shouldn’t on a table for two. It was a little tacky! Loved it. Service was superb and food was excellent. We’ll be back! Excellent food and outstanding service. I've been many times and plan to continue going many, many more! Really opentable become a bit more realistic. The food was lousy, service is far below par.... not a good place at all. Just a lovely experience. Wonderful service, excellent food. Made our Christmas Eve very special. Fine. The food os certo good and the serviço also. The restaurant is good, but needs to be cleaned up a bit. The wine room had a mildew smell that forced us to choose outside dining. The occasional motorcycle or noisy car was a distraction. The service was good. The high point is their appetizer option; 5 picks for $23! It was excellent...especially the Octopus! I really want to like this plave. It's a cute concept with the setting what should be romantic but the street noise just killed it. The foods are good but not exceptional. It's within Italian gourmet restaurant standard. The pastas cooked perfectly al dente with the right flavour of sauces. overall the dining experience at Via Verde is always great! Their food is really terrific, and so is their service. This is not a large place, so they have cozy tables and a nice ambience. I had the branzino and it was really terrific. Their wine list is good and affordable. This place is very good! A casual spot and a wonderful find. The AUTHENTIC Italian food is deliciously prepared and the service is very genuine and friendly. 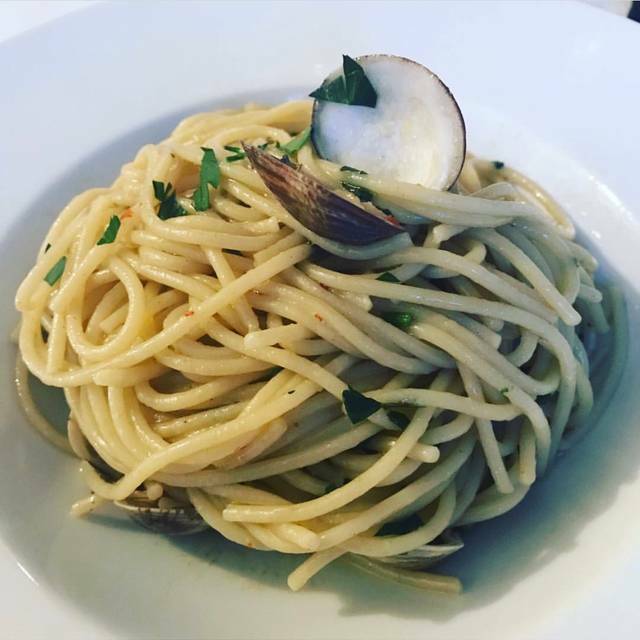 We chose to order dishes that were basic Italian dishes but they were prepared with just a the right touch of original flair that made our casual lunch really stand out from typical Italian fare. We were very impressed and we look forward to returning to this little gem! Great spot if you want a casual lunch/dinner. Nothing amazing, but it is good for the price.